Choose from our wide selection of punchboards, book cover punchboards, and plain punchboards. We carry punch boards from the major manufacturers - VFW punch boards, Eagles Punch boards, Pluck-a-Cherry punch boards, and many others. If you are interested in punch boards that you do not see here, please contact us to find out if we carry them. Punch boards are in stock for immediate shipment. For a FREE 96 page catalog, please contact us at 1-800-233-0828. Your satisfaction is guaranteed when you order punch boards from us. Read on to learn more about punch boards and how to make more money or raise funds with these games of chance. What are Punch Boards and Who Uses Them? 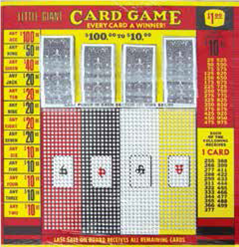 A punch board (punch card, push board) is a game of chance used for profit making or fund raising. Each punch board is made of a piece of wood or cardboard that has hundreds or thousands of holes. Every hole contains a piece of paper (or multiple paper slips) with a number or combination of symbols printed on it. All holes are covered with a foil or paper seal to enclose the paper slips. Each punchboard has a corresponding chart. The chart lists winning numbers or symbols and prizes. American Legions, VFWs, Bingo Halls, Churches, Schools, Bars, Casinos, and many other Organizations use punch boards to raise funds or to make more money. It's easy to make profits or raise funds with punch boards. Each punch board will arrive as a complete, money-making game. With our punch boards, you will make up to hundreds of dollars in profit per game. With plain punchboards and bookcover punchboards, you choose the profit you make. Your players can win up to hundreds of dollars instantly, so they have a great incentive to buy opportunities to punch. When you start a game, you display the punch board chart and sell opportunities to punch out the paper slips in the punchboard. You generally charge 10 cents, 25 cents, 50 cents, or a dollar per punch (depending on the punch board game you choose). With plain punch boards and book cover punchboards, you can charge any amount you choose. If a player's paper slip(s) has numbers or symbols that match the winning combinations on the punch board chart, then he wins! Punch Boards are not legal for use in New York State and therefore cannot be sold to customers in New York.